The yellow and gray dress is a vintage 60's frock from Secret Lake. 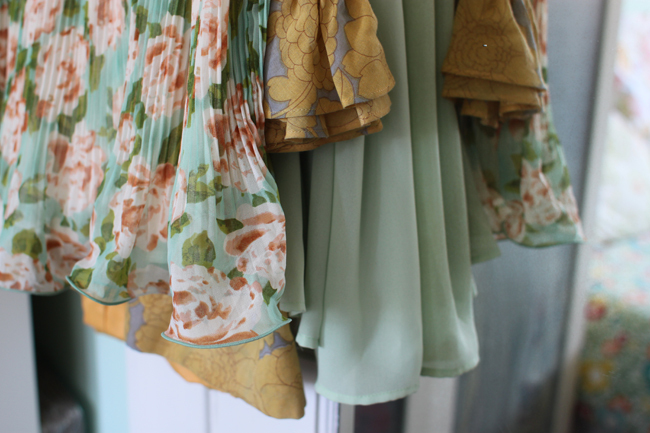 Sometimes my insatiable appetite for vintage (and pretty things in general) becomes overwhelming. I tend to acquire new things so frequently that I couldn't possibly share them all on Fancy Fine. It's even worse these days because I'm constantly shopping for the store, which means of course that I always find a treasure or three to keep. So, having a quiet morning to myself, I decided to share a few things around my apartment and inside my closet. Um, one of my closets. 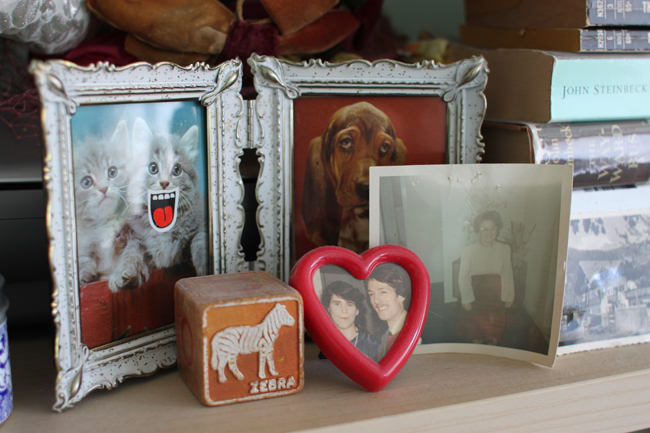 The heart frame contains a photo of my silly parents when they were newlyweds. Their 30th wedding anniversary is next weekend! 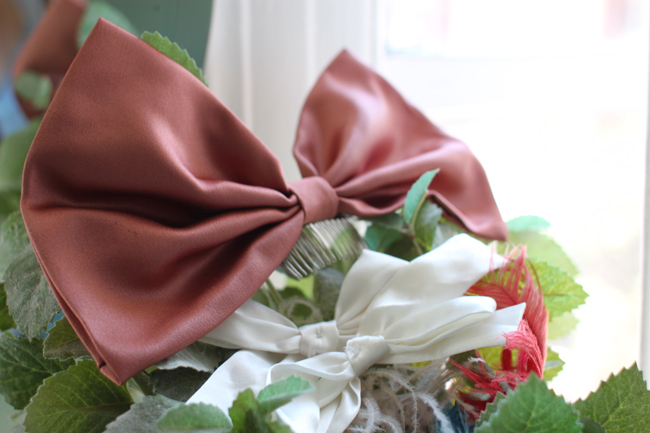 A beautiful hair bow made by Alexandra Grecco, a gift from Frankie. 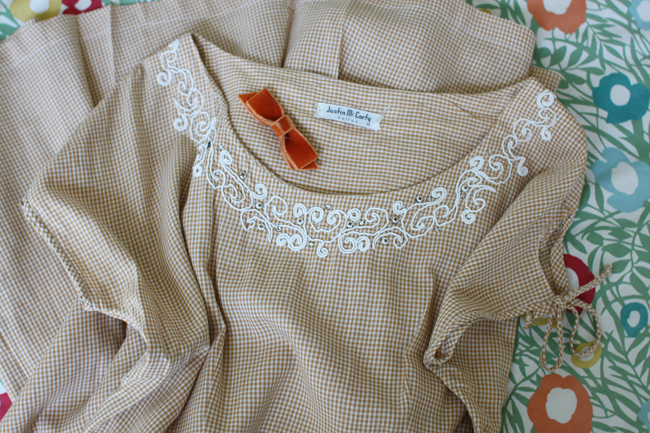 My outfit for the day: a vintage dress from Dear Golden and a little velvet hair bow. The silver heels are from a vintage/thrift store called Clothes Contact and the other pair is from here. 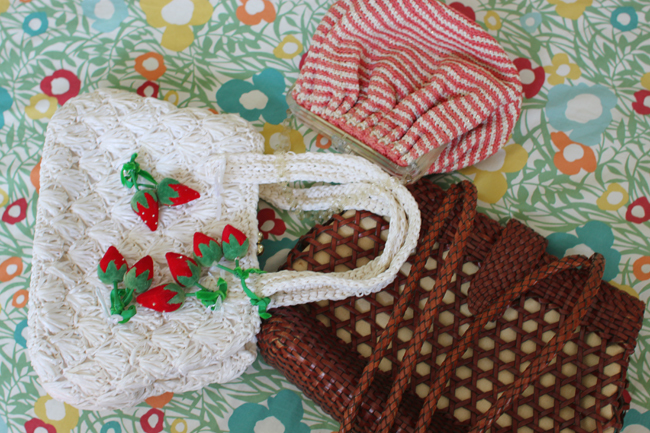 The white bag is from a flea market, the striped one is from Bohemian Bisoux, and the leather one is from Omnia Wears. 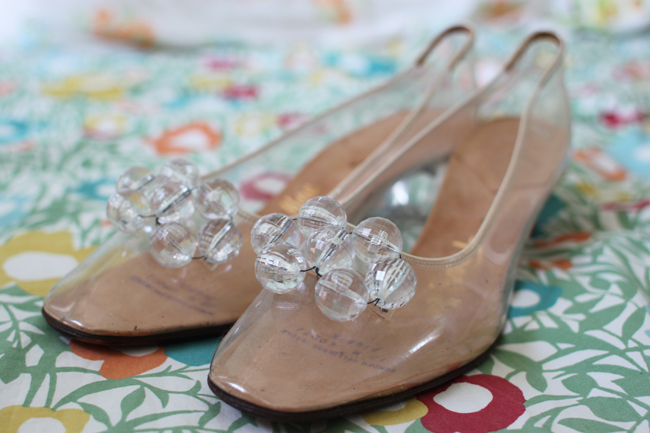 Amazing clear heels from Mother's Daughter. those clear heels are the most beautiful shoes I've ever seen! Christina: I didn't change the sole but I did stick on one of those Dr. Scholl's non-skid patches. I haven't really worn them much yet so I'm not sure how well that works out on the streets... hopefully I don't have an unintentional Risky Business moment! Hahaha 'one of your closets'. I find storage issues constantly competing with my desire for new things. 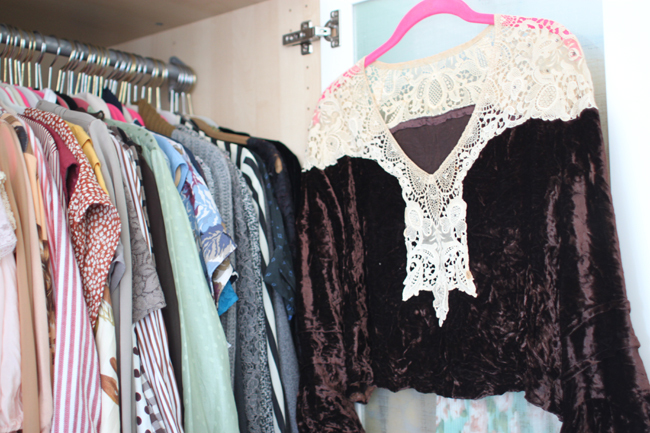 Sometimes I aspire to be one of those people who has a super-simply wardrobe with a perfectly edited collection. But then I open the doors in an attempt to cull.. and can't bear to move any of my pretty things! wow, if you ever clean out your closet and want a little thing to help you with donations you know who to contact :)AMAZING! you have some of the most beautiful clothes! 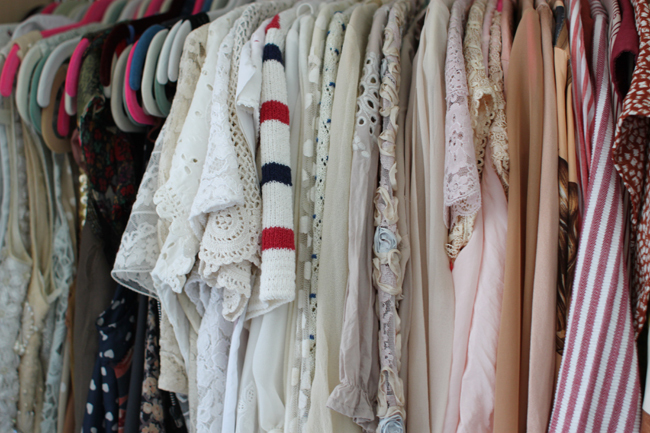 I'm quite jealous of your closet. Well, your closet is obviously way too full and I should probably come over and help you clean it out. :D I have Monday the 13th off from work. Maybe we should go on a thrifting adventure. When are you free? great post! 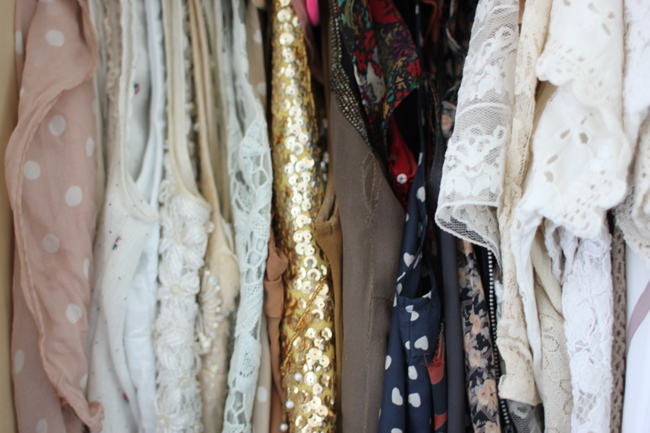 as per my request to see more fo your closet ;D everything look so beautiful. 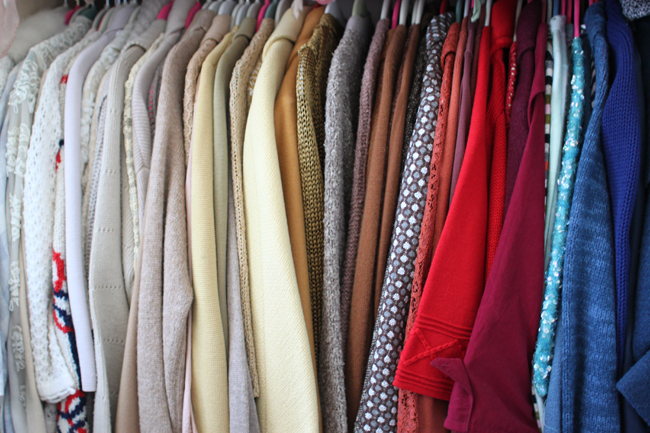 looks like you have more sweaters and jackets than i have ever seen one person own. guess its that crazy san fran weather. lucky girl! this type of post is my very fav :) you've inspired me to do one soon. Wow! Nice pictures :) Everything is so beautiful! wow, your're pretty organised. 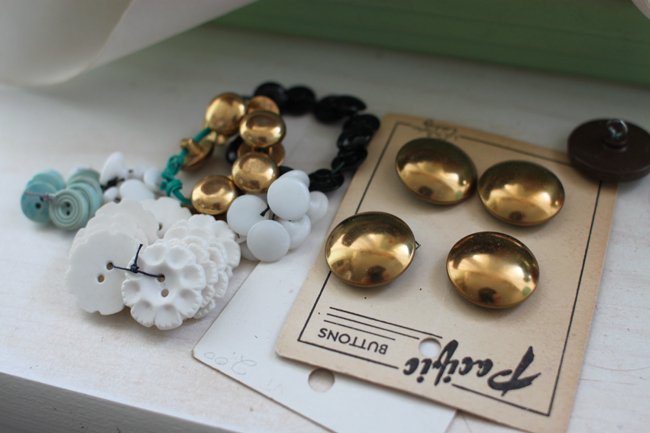 lovely items too..
need to build a walk-in wardrobe soon! i love those clear heels, so perfect! You make me look like a minimalist. I didn't think that was possible. Clothes Contact is my favorite vintage shop in SF. It was my first experience with by the pound vintage, and I really appreciate that they have rad stuff at better prices than a boutique. Glad others are finding stuff there as well! You just got me so jealous! Gee whiskers your wardrobe is a magical place.